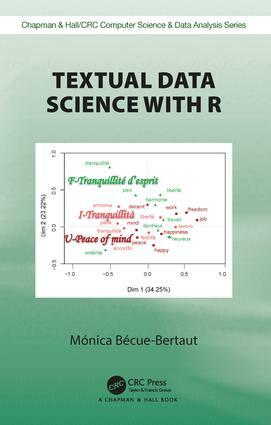 Textual Statistics with R comprehensively covers the main multidimensional methods in textual statistics supported by a specially-written package in R. Methods discussed include correspondence analysis, clustering, and multiple factor analysis for contigency tables. Each method is illuminated by applications. The book is aimed at researchers and students in statistics, social sciences, hiistory, literature and linguistics. The book will be of interest to anyone from practitioners needing to extract information from texts to students in the field of massive data, where the ability to process textual data is becoming essential. Mónica Bécue-Bertaut is an elected fellow of the International Statistical Institute and was named Chevalier des Palmes Académiques by the French Government. She taught statistics and data science at the Universitat Politènica de Catalunya and offered numerous guest lectures on textual data science in different countries. Dr. Bécue-Bertaut published several books (in French or Spanish) and work chapters (in English) on this last topic. She also participated in the design of software related to textual data science, such as SPAD.T and Xplortext; being this latter an R package.